We tend to give little thought to mustard; we merely regard it as a tasty addition to hot dogs and hamburgers. There is more to this yellow condiment that meets the eye. Mustard comes in many forms, from the condiment we are used to, to seeds, powder, and oil. The mustard plant, which produces the seeds, leaves, and oil has many applications and can benefit your health in a variety of ways. Each form of mustard contains its own unique benefits and uses. 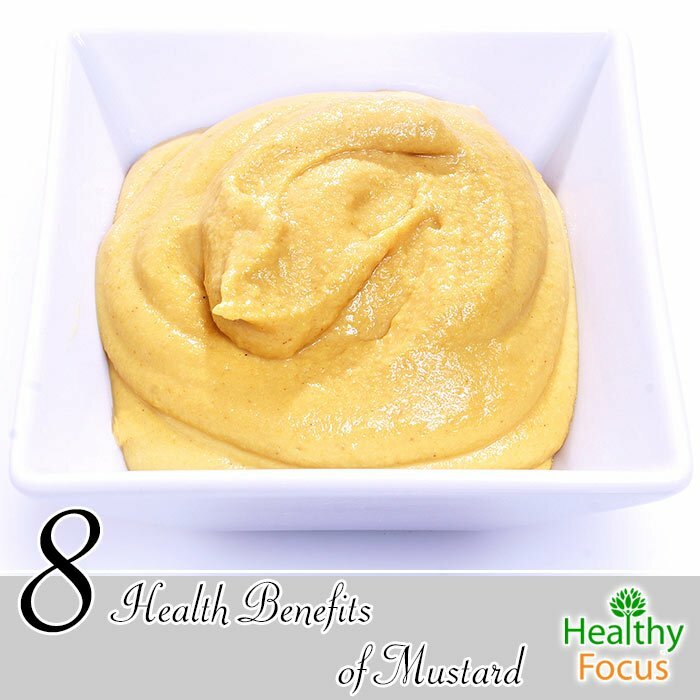 Boasting a rich nutritional content, mustard is an excellent source of minerals, fiber, magnesium, calcium, potassium, folate, phosphorous, and vitamins A, C, and K.
These nutrients help to set the stage for mustard’s ability to not only benefit your health, but also help treat a wide array of conditions as well. The anti-inflammatory abilities of mustard seeds help to reduce the inflammation and lesions characteristic of the autoimmune disorder psoriasis. Some research has found that these spicy little seeds encourage the activity of enzymes such as catalase, glutathione, and superoxide dismutase. These enzymes help provide a protective barrier on the skin and encourage healing. Another skin condition mustard seeds help with is contact dermatitis. Some preliminary studies have found that these seeds reduce inflammation and swelling while promoting the healing of skin tissue. This can help to soothe some of the discomfort associated with the condition. Ringworm is uncomfortable and unpleasant. Fortunately the antibacterial properties of mustard seeds help expedite the healing process of lesions caused by the condition. Applying a paste made of mustard seeds directly on the lesion will help reduce discomfort and help encourage healing. Regularly enjoying mustard greens in your diet can help keep your body clean. Mustard greens have been shown to have a detoxifying affect while increasing your consumption of beneficial dietary fiber. What makes mustard greens a great detoxifying agent is its content of glucosinolates, which help prevent the buildup of toxins. Women suffering through menopause may want to add mustard greens to their diet. Regularly enjoying mustard greens may help prevent the development of the symptoms associated with menopause, such as bone loss. Mustard greens are rich in magnesium and calcium; these two minerals protects the bones by preventing bone loss and the development of osteoporosis. Cooking with mustard oil may prove to be beneficial to your heart health. Some preliminary studies have found that mustard oil has been associated with reducing cardiac arrhythmia, due in large part to it’s content of omega-3 fatty acids. So the next time you’re looking for a healthier cooking oil, you might want to reach for the mustard oil. If you are looking for ways to help regulate your cholesterol or to protect your cardiovascular health, consider adding mustard greens to your diet. Cruciferous vegetables like mustard greens attaches itself to bile acids during digestion, helping to move them safely and efficiently from the body. Bile acids are comprised largely of cholesterol, so removing it from the body helps to reduce overall cholesterol levels. Mustard greens are rich in nutritional content and are a great way to help prevent blockages in the arteries. Some studies indicate that regularly consuming mustard greens helps prevent blood platelets from clumping up, therefore preventing blood clots from developing. Mustard seeds might be able to help alleviate the uncomfortable symptoms associated with cold and sinus infections. Mustard seeds have expectorant properties, helping to clear out clogged sinuses and air passages. The heating qualities of these little healing seeds help to soothe inflamed, sore throats and sinuses. Although it sounds disgusting, mustard water can offer some pretty amazing benefits. Hiccups seems to be one of those things that has no cure, something that you just have to endure and wait out. If you’re not the patient type, you might want to give this home remedy a shot. Mix two teaspoons of mustard powder into a glass of warm water. It is believed that slowly sipping on this elixir will help get hiccups under control. If you are feeling a little backed up but do not want to rely on over the counter medicine, you can try drinking this natural, home remedy. Mix a tablespoon of white mustard powder with two cups of honey and four cups of water. Take a tablespoon of this remedy to help get things moving. You can take this remedy daily to help keep you on a regular schedule. Mustard seeds have anti-inflammatory and heating properties, making it a great natural remedy for a sore throat. Simply make a tea of the seeds by steeping them in a glass of hot water. Let the mixture sit until it’s not too hot, and then gargle. This will help bring relief to a sore, inflamed throat. Any form of mustard should not be used in place of traditional medicine to treat any condition or ailment. Please consult your physician before considering mustard as a treatment. Consuming mustard in large doses can result in nausea, diarrhea, vomiting, and drowsiness. People that suffer from kidney stones beware: mustard contains oxalate, which may prevent the absorption of calcium. Uncooked mustard seeds might interfere with the thyroid gland, so if you suffer from a thyroid disorder, always cook mustard seeds before ingesting. Mustard seeds have a heating affect, so those with sensitive skin take caution. Before using mustard as a topical treatment, try conducting a small allergy test, as some people may be sensitive to the affects of mustard seeds.